It is a Saturday early evening and all of Charlotte is packed into a brewery. Somewhere. It seems as if the entire city is in a brewery within the city limits. Or at least that is how it feels these days. This isn’t a bad thing. Not by a long stretch. It is also really fun to check out the different spots and see what makes it unique and sets it apart from the others. Aside from the home-crafted creations, which seem to be getting more and more creative with each passing year, very little truly differentiates breweries from each other. This model works though, because expectations are easily met when the potential for variation is at a minimum. One business that has figured out how to put a new spin on the whole brewery scene is The Brewers at 4001 Yancey. Their spin? 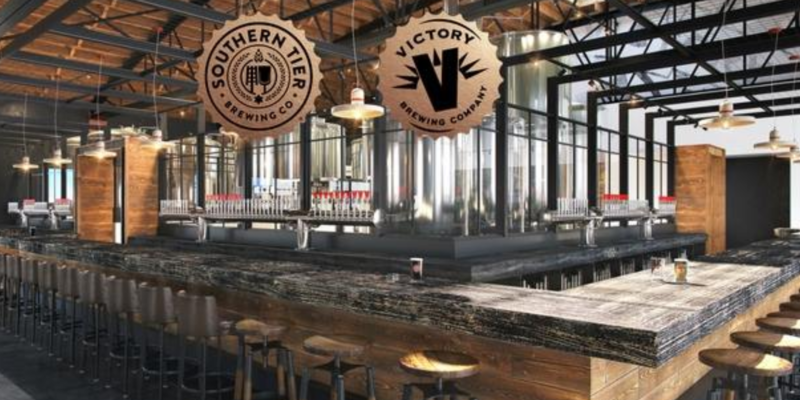 Multiple brewers in one spot- Southern Tier and Victory. These are larger, more national brand craft beers and have a combined thirty-eight years of brewing experience. That is a whole lot of trial and error to the point where they have the system down to perfection. As opposed to some of the newer breweries that have grown out of someone’s side hustle, this particular brewery is the embodiment of collaboration. Very unique brews from multiple vendors are served on tap and enjoyed. The other day, I had the Samoa beer and the Charlotte Blonde Coffee, oh my word, I am not sure which I enjoyed more, but the flavors were incredible. Also incredible at this place is the food. Typically, when your think brewery food you think, basics or food trucks. The gourmet kitchen at The Brewers makes this a destination space for foodies. Ninety percent of the menu incorporates the beers in their ingredients and also have a pint or two ready as a pairing suggestion. The Brewhouse burger with the hop devil mustard is the PERFECT dinner on a chilly winter’s night. One of the things I love most about breweries are their vibes. They can be fancy, casual, rustic, sleek all at once. This is due to the fact that many of the breweries in are flipped abandoned warehouses or buildings. The Brewers is no exception. It is the transformation of a historic mill which was home to Bowers Fibers, a textile company that has been around since 1946. Another other cool fact is that the fermentation tanks are the original ones used by Victory Brewing in 1996- they were transported to this location from New York. So the mix of old and new combine throughout the location to give a great ambiance. Not to mention the ample outdoor space and huge wrap-around bar. Even when there is standing room only, the wait for beer is not bad at all.